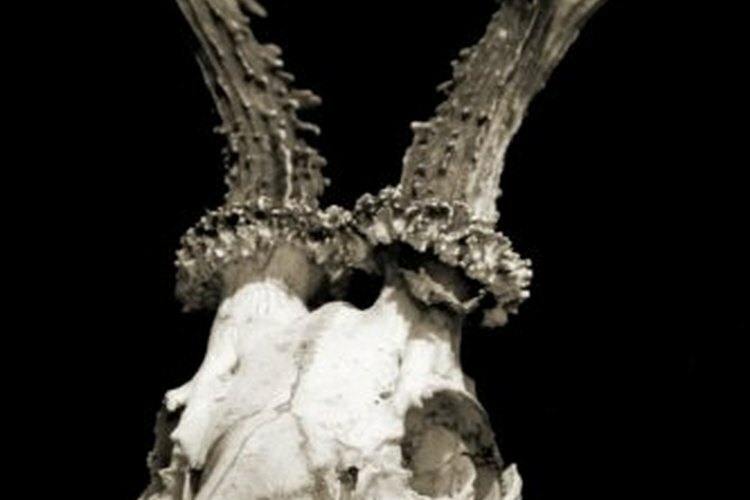 A "Texas mount" displays a deer's skull. People hunt deer for meat, trophies or just for pure enjoyment. When it comes to mounting a trophy deer head, various styles have emerged, nearly any of which will help you highlight a prize catch. The Texas mount, sometimes called a European mount, is one of the simplest and most elegant ways to display your deer head. Mounting your trophy Texas style can take time but can be a rewarding experience. Skin the deer skull. Run the skinning knife straight down the center and the back of the skull and around the bottoms of the antlers. Make sure you cut deeply enough to slice all the way through the skin and flesh. Starting at the top of the skull, grab onto the skin with some pliers and pull down and out with the pliers to remove the skin. You can trim along with the knife as you go to remove as much skin and flesh as possible. Place a propane burner outside, and set a large stock pot on the burner. Place two cups of washing soda in the pot, then fill the pot with water. Turn the burner up and allow the water and baking soda to come to a rolling boil. Be sure this is a pot you do not plan to use for cooking again. Submerge the deer skull in the boiling water. Add more water if necessary to cover the skull. Allow it to boil for 45 minutes to an hour to help loosen the remaining flesh from the skull. Pick up the skull carefully and lay it on a flat surface, such as your lawn or driveway. Scrub the skull with a wire brush to help get rid of any tendons or sinew still clinging to the head. Use tweezers or pliers to pull off any stubborn bits of skin. Turn on a hose and spray the skull off to remove any last bits of skin or flesh. Set the skull on its side and direct the hose into the head cavity to clean out any standing water or flesh that might have accumulated inside. Fill a large plastic container with hydrogen peroxide, then immerse the skull in it. Don't let the antlers touch the peroxide, as they are softer than bone and will be damaged by the solution. Allow the skull to rest overnight in the peroxide, which will whiten it. Remove the skull from the peroxide and lay it in a sunny spot in the yard. The sun will help bleach the bone, making for a white, clean skull. Lay the skull in a well-ventilated area and coat it with a layer of lacquer. Cover all of the surfaces in a thin layer, then allow that layer to dry thoroughly before coating the skull a second time. This lacquer will help preserve the skull and will add shine to the trophy. Attach the skull tightly to a mounting plaque. Most plaques have screws or bolts for this purpose. Keep the skull refrigerated until you're ready to skin it. The cooler you keep the head, the better the finished product will look. Do not boil the skull too long. If you boil the head for an extended period, the bones will separate, and you'll have gaps in the finished product.